The Aluminum Reacher with Magnetic Tip is a folding and non-folding reacher that has 2-1/2" opening feature and has interlocking tips. The Serrated jaw offers a secure grasp. At the tip of this reacher there is a magnet that helps pick up lightweight metal objects. 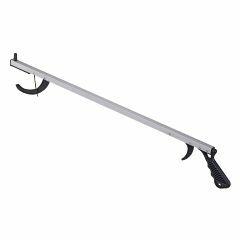 Whether you are trying to grab something too high or too low, the HealthSmart Aluminum Reacher does the job. You no longer have to worry about reaching that item on the top shelf or the one that fell behind the furniture! The HealthSmart Aluminum Reacher eliminates excessive bending and reaching. It does the hard work by securely gripping the out-of-reach object, helping to protect your back in the process. The aluminum frame and plastic handle and jaw ensure that it is not only lightweight but sturdy as well. And it even has a magnetic tip for picking up light metal objects like screws or paper clips! Lightweight. Easy Storage. Safe. Sturdy. Versatile. Elderly. Following Surgery. Emergency. Anytime. expectant mother. Elderly. Average Health. people with bad balance. after hip replacement. I have had one of these for 20 years and use it for anything on the floor that I need to reach. I have bought these for friends and family members who use them for daily tasks. Really gets into close places and behind things to rescue items. I have more than one in places I use them most. One is helpful near the computer and one by the easy chair to reach fallen items. Can't do without this reacher. I learned of this product when I left the hospital after hip replacement in 1997. Flimsy. Screw on end stripped out. Lever on end not flush. by Disapointed from Houston, Tx. Elderly. wheelchair bound. Medical Professional. Spinal damage. SpinalDamage-Use Pwr-Chr..
Well made Reacher really helps ! Elderly. BAD BACK CAN`T BEND OVER . hard to bend over. This reacher is sturdy and lightweight. The magnetic tip is an excellent addition. wheelchair bound. People in Bad Health. people with bad balance. Knee Surgery. Carpal tunnel & Arthritis. Limited Mobility. and fibromyalgia. hard to bend over. gets behind things. This reacher is high-quality. I have a poor-quality reacher, which I am going to recycle at the end of this sentence. i HAVE FOUND A BETTER RPICEW THROUGH AMAZON FOR AS 32 INC FEATHERLIGHT DESIGN REACHER FOR $15.00 AND FREE SHIPPING FROM A MEDICAL SUPPLY HOUSE. BEAT THAT. I have a Reacher #4109 with a magnetic tip but also a rubber gripper at the end. The rubber is starting to wear. Can I just purchase rubber ends? It's yellow. I suggest you take your reacher into a craft place and see if they might have small pieces of rubber to substitute with superglue. My next stop woud be a good hardware store like Lowes or Menard's. Good luck. Answered on Apr 21, 2014 10:51:31 AM by bobby from Kansas City, Mo.